I have a love/hate relationship with Pinterest. 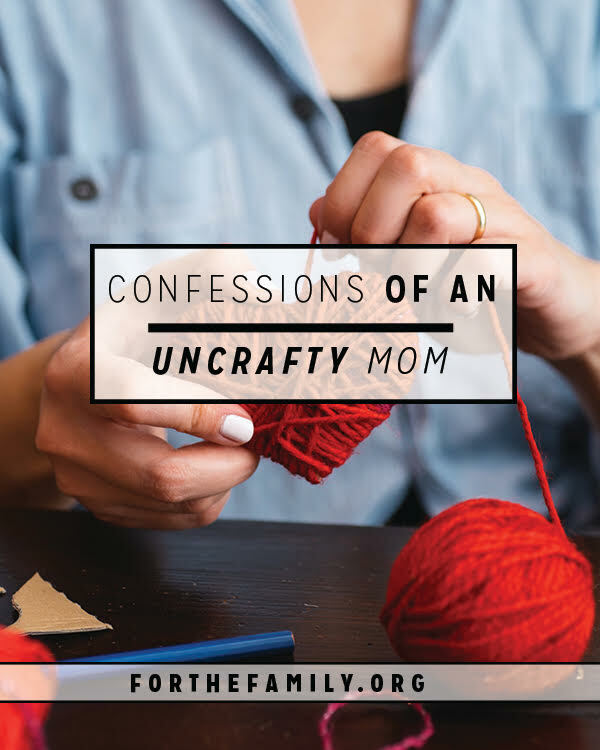 One on hand, I love exploring all the fancy crafts, fresh recipes, the DIY, oh my! So many creative ideas I would never have come up with on my own! How helpful and inspiring! Watch me as I pin all six hundred shiny images to my boards at once! But on the other hand? Who am I kidding. I’m what you’d call a domestic klutz. In my mind I have wonderful ambitions for hot gluing and stir frying and refurbishing all the things. But in practice, I have neither the time nor the mad talent to get ‘er done. I’m not going to get into a bashing session on the ills of information overload. We all know social media spits more images and ideals at us every hour of every day, and we’re responsible to absorb what we can while ignoring the rest. No one soul can take on the work of the whole world, nor should we. But as moms I think we still want to do it all. We know we don’t need to, we know our identity is in Christ and not in the quality of our puffy paints or sewing kits (or lack thereof). We’re not ignorant of the comparison trap, and practically every blogger in the Christian community is fighting against it. Yet regardless of the permission we’re granted to place limits on what we are able to do in a day, many of us still desire to do more. As if doing more makes us better parents. But—what if the reverse is true? What if being a better parent is all about doing less? Instead of trying to enroll in every activity, cook every new crock pot recipe, or mod podge every craft, what if we just chose one? As in, one at a time, at lengthy intervals. Because trying new things is healthy and fun, yes. But doing familiar things is how we make our house a home. For example, last week, I made one craft with my children. And we did it well. We learned something new and celebrated our success. But with the remaining hours of the week I fed them macaroni and told them to play with their same old toys. This week, maybe I’ll choose a new recipe. Maybe some fancy chicken dish that my husband will devour and the kids will ignore (because let’s be honest, they’d rather eat the macaroni). Or maybe I’ll feed them all tacos again like I do every week. There’s nothing wrong with that. Everybody likes tacos. And later this summer, maybe we’ll actually tackle that amazing chair refinishing project we found, but if we do, you’d better believe there won’t be much time for anything else. Or at least anything else out of the ordinary. Because by taking on new experiences just one at a time, we can maintain our lifestyle of little ordinary things—swimming, reading, biking, playing in the back yard, watching TV or playing apps (yes, I allow screen time in my house, I am not ashamed!). These are the activities that comprise our cozy, unglamorous life. And we love it. Nobody is pinning about our checkers board or our plain popcorn snack. Yet those boring ingredients create our familiar and blessed family life, and I’m not about to replace them with more Pinterest-worthy options. That would not make me a better mom. It would make me a busy mom. And I’m done with busy. So sure, I’ll keep pinning those lovely recipes and crafts because they are just that—lovely. And spending a little time on Pinterest is indeed one of those “boring” activities I enjoy doing from time to time. But as for following through, well—that’s just not an expectation I’m willing to place on myself. And you shouldn’t have to, either. So then. For all my fellow uncrafty or culinary challenged moms, show me your macaroni and I’ll show you mine. Creating a sanctuary for our families does not require acrylic paints and washi tape. It requires love. And God gives that to all of us in abundance. This really resonated with me. I have gradually begun to discover that it is okay to make “big and fancy” an occasional thing, and to keep things simple as the default. Particularly when life is overwhelming, going big&fancy will just add to the overwhelm.